In our latest App release, there’s a little something you’ve all been waiting for. That’s right - UK residents now have their very own Revolut GBP current account! ???????? Opening a current account with a bank is a pain. There are a bunch of hurdles to jump through including credit checks; providing a proof of address; and trips to a depressing high-street branch with your ID. Newcomers to any country are often presented with an impossible catch-22: to rent or buy a home, you need a bank account. But to get a bank account, you need proof of address. Sigh. Our latest update eliminates these hurdles, enabling UK customers to open a free Revolut current account from a smartphone in 3 minutes. There’s no need for proof of address or a credit check: new users can verify their account with a simple selfie and snap of their passport. 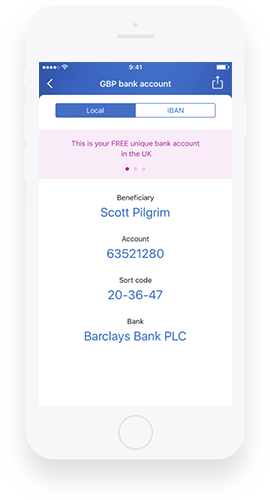 Revolut users who live in the UK now have a personal UK account number and sort-code; can receive payments like a salary into their account; and transfer money to any UK bank in just a few hours. You can find your account details in a couple of locations in the app. Tap ‘Top Up’ by ‘Bank transfer’ and choose GBP to find your unique account details. For quick-access, go to the ‘Profile’ section of the app and tap 'Account details’. You can send your account details to anyone via the export button in the top-right of the screen. This update makes it even easier to use Revolut as a bank account. Whilst Revolut technically isn’t a bank, our app lets you do most of the things that a bank does - but better! You can receive a salary into your Revolut account and use our spending analytics feature to see a breakdown of your monthly spending by shops or categories like transport and restaurants. Plus, you could set yourself a monthly spending limit for your RevolutCard to help you stick to a budget better. Once funded, the Revolut account is like having a local bank account wherever you are. You can spend or transfer money around the globe fee-free with the real exchange rate and take advantage of other features like blocking your card temporarily, splitting bills instantly with your phone contacts and real-time payment notifications. Personal IBANs for EUR and USD ???? Welcome to a world beyond banking. The future is here.